The Certified Administrator Surgery Center (CASC) credential is a tangible way to demonstrate your deep understanding of the skills and knowledge required to be a successful ASC administrator. But in order to earn the certification, you must pass the CASC exam. Like any exam, there are a variety of ways to prepare. 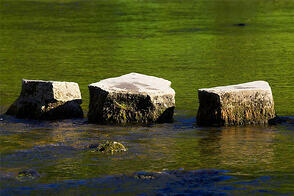 Some people proactively seek tools to help them succeed. Some go into the exam without prepping at all. For seasoned ASC professionals with a vast knowledge base from which to pull information, the latter approach can work. However, for most candidates, going in blind isn't an effective way to increase their chances of success. The good news is that there are many valuable resources available, including the CASC review course and online tools. Some enterprising test-takers even create their own tools, including flashcards and notes to help with financial calculations. The fee for the exam is $750, and prep materials can cost almost as much. Many applicants have to pay out of pocket, but it's a good idea to see what options may be available to help offset some or all of the costs. Does your employer offer continuing education benefits? Some people are fortunate enough to have their employers pay for them to take the CASC exam. Sometimes the center covers the exam and if the person doesn't pass, they must reimburse the center, plus pay for the repeat exam on their own. Another option could be to negotiate an agreement where your employer agrees to reimburse you for the costs once you have passed. This way there is less risk to the center for which you work. Regardless of how costs are covered, the CASC exam is a good investment in your professional development. When the first CASC certifications were earned in the early ‘90s, the influence they would carry was not yet clear. Today, the CASC certification has become like the Good Housekeeping Seal of Approval when it comes to identifying professionals who have the motivation, initiative and drive to stay current with best practices and trends. The certification helps distinguish you from others—and that can lead to new career opportunities. People often ask about the exam's level of difficulty. The answer depends on the test-taker's knowledge, skills and experience in the ASC setting and whether the person is more business or clinically focused. Delivery of Patient Care—Covering things like patient rights and responsibilities, maintenance and security of medical records and understanding of medical terminology. Quality Management—Including questions on risk management and safety, monitoring of physical environment and quality assessment and performance improvement programs. Human Resources—Which covers the employee selection process, administration and performance measurement. Financial—Covering topics including accounting, reimbursement, materials management and business growth and development. Regulatory and Legal Issues—Including items like governance, compliance, licensure and contract negotiation. Considering your working knowledge in each of these areas is key to figuring out how much preparation you need for the exam and where to focus. For example, if the applicant does not have a clinical background, this can be a challenging new area to master without practical experience in the surgical arena. Nurses seem to have an easier time coming up to speed on business and financial topics and are very proficient in adminstrator roles. Many applicants have noted that the emphasis on legal and regulatory issues can be difficult to prepare for, unless you have dealt with it regularly leading up to the exam. Successful test-takers have said that the best thing they did leading up to the exam was to prepare, prepare and prepare some more. You can download a wealth of helpful materials here, including an online practice test. Talking to past test-takers to familiarize yourself with the exam's structure. Of the 80 questions, 40 are new and 40 are carried over from previous exams. Ask how the five major topics were addressed and focus on building knowledge in your weaker areas. Simulate what it's like to take the CASC exam so you understand the time constraints, format of the questions and how your mind will react to the stress. Once you register and are accepted for an exam date, you will receive an email with a link to the practice exam, which costs $250. You'll have 45 days to take it. Do it. It will provide you with information about where you did well and where you can improve. Looking back on my personal experience, I believe a number of factors contributed to my passing the exam. While I was not a "traditional" candidate, coming from a healthcare IT company, my diverse experience in various roles working with ASC customers at SourceMed – in Human Resources, Implementation and Training, and most recently as a leader on the Client Services Management Team – afforded me transferrable knowledge that was directly relevant to 4 of the content areas covered on the exam. I identified Delivery of Patient Care as the area I needed to focus on the most. While I grew up surrounded by medical terminology and learning about patient care standards through my Mom, who is a nurse, I knew that alone wouldn't be enough. I relied upon guidance of SourceMed colleagues, exam resources and discussions with CASC-certified acquaintances to supplement my knowledge in this area and was able to pass the test on my first attempt. The best advice I have for someone taking the CASC exam? Assess your own areas of strength and weakness, and be honest with yourself. 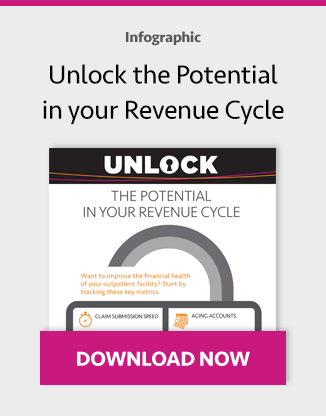 This will help you determine the approach that will work the best for you. There's more than one way to be successful! What would you "Ask a CASC" if you had the chance? We've begun this Q&A blog series to help you navigate the most important issues in ASC management. 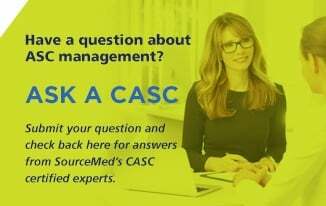 Submit your questions via the form on the right and check back for answers from SourceMed's own CASC certified experts.